The two largest schools of Pure Land Buddhism in Japan are Jodo Shu and Jodo Shinshu, both of which have several divisions. In addition there are a number of smaller Japanese Pure Land groups, and, of course, there are also Pure Land-oriented1 schools that developed in China. Thus, we cannot address all of the variations on how the Pure Land is understood within all of these sects, and we cannot do justice to all of their interpretations. Nevertheless, the fundamental belief in trusting Amida Buddha's vows, recitation of the nembutsu, and eventual entry into the Pure Land are accepted by all of them. For the moment we will stick to the two largest Japanese ones and later add some information on the others to round out the picture as much as is possible. Ritsu, a school directly derived from one of the original 18 or so Indian Hinayana2 schools. It was distinct from the other Nara schools by accepting a very large Vinaya, one of the three so-called baskets of the Tripitaka scriptures, prescribing the rules of discipline for monks. Jojitsu, which may have had its earliest origin in the Mahasanghika school, another one of the early Indian schools, which subscribed to a comparatively small Vinaya. It also underwent some significant adaptations to Chinese culture before reaching Japan. Hosso, a descendant of the early Sarvastivada school, which had become transformed into the Mahayana Yogacara school under the hands of Vasubandhu and others. Kusha, a school that apparently paralleled Hosso in its teaching, but was administratively separated. Sanron, the Japanese version of Madyamaka, the philosophical Buddhism developed by Nagarjuna. Kegon, an "esoteric" school of Buddhism. That is to say that, similarly to Vajrayana (Tibetan Buddhism), blended Buddhism with various animistic and magical practices. When Chenyen, a Chinese adaptation of Vajrayana became popular in Japan under the name of Shingon, it absorbed Kegon. We see here a microcosm of the world of Buddhism in the first millennium AD. Two schools (Ritsu and Jojitsu) are representative of early Hinayana Buddhism, providing an example of one school with and one without a Vinaya. Two of them (Hosso and Kusha) display the intermediate stage in the transformation of Hinayana into Mahayana under the Yogacara banner. The fifth (Sanron) emphasizes the philosophical platform, Madhiyamaka, that ultimately became accepted by most religious groups in Buddhism, and the last one is a case in point for the adaptation of Buddhism to popular folk beliefs in the supernatural realm. During the next three centuries, two other schools, Tendai and Shingon, took over in popularity. During this time period, known as the Heian era, it was common for members of the nobility to become monks shortly before they would die. Buddhism was turning into a religion for the well-to-do, who could afford to take time away from their work in order to pursue nirvana. Some of the schools of Buddhism also took their differences quite seriously. They recruited monks and ordained them specifically in order to serve as soldiers in religious disputes, and violent confrontations between monasteries were no uncommon. For common lay people the deep principles of esoteric Buddhism as well as the disagreements and the violence they engendered were lastly irrelevant. They were not on the way to nirvana anyway. The man to whom we refer as Honen was born in AD 1133 under the name of Seishi-maru to a prominent family. When he was nine years old, his father was killed, and his last wish was for Seishi to become a monk. So, he began studying Buddhism for many years. When he was thirteen years old, he ascended to Mt. Hiei, the center of the Tendai school, if not of all Buddhism in Japan, at the time. Honen applied himself with earnestness and discipline, and received full ordination. However, even though he was a brilliant student, he was not satisfied with what he was learning. He was looking for personal peace as well as the opportunity for a way that would benefit all people. We obviously cannot know all the books that Honen studied, though given the amount of time he spent studying, he clearly undertook a lot of research. Tradition holds that he read the entire Tripitaka three times. However, it was the writings of Shandao that finally opened Honen's mind to the salvation of Amida, the nembutsu, and the Pure Land. Honen was technically still a member of the Tendai order, and he had hoped that things would have stayed that way. However, the fact that he regarded all practices other than chanting the nembutsu as inessential, did not go down well with the leaders of the order. Furthermore, he persuaded an ever-increasing number of other monks as well as lay people to his teaching, and some of them displayed a less conciliatory attitude than Honen's. The inevitable split occurred, and, thus, almost by default Honen became the founder of the first independent Pure Land school, called Jodo Shu--the school of the Pure Land. Among his many disciples, at least three became important in the subsequent development of the Pure Land movement. Shoko (1162-1238)�became the second patriarch of Jodo Shu. In this connection "patriarch" no longer has the connotation of "forerunner," as it did on Shinran's list, but reverted to its more usual meaning, namely "head of the order." Shoku (1177-1247)�started the branch of Jodo Shu. It followed most of Honen's teachings, but was more open to the idea that other Buddhist practices did have some merit, even if they paled in comparison with the recitation of the nembutsu. Shinran (1173-1262)�started Jodo Shinshu (the �True School of the Pure Land�), about which we shall have to say a lot more later. Now, we need to pause here for a moment in order to understand what it is that Honen had realized, standing on the shoulders of the previous six so-called patriarchs. First of all, his discovery was that anyone could attain the Pure Land thanks to the work of Amida Buddha, and that one should rely on Amida alone. Furthermore one expressed one's reliance on Amida by constantly chanting the nembutsu, "Namu Amida Butsu." Honen taught that the nembutsu should always be on one's mind if not on one's lips. 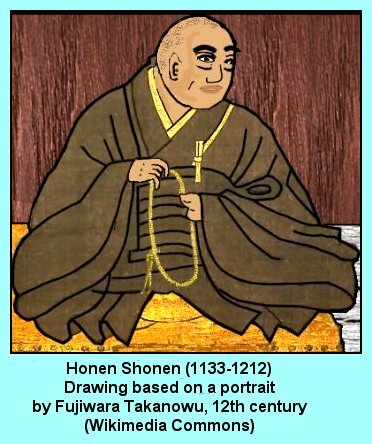 Honen did not forbid traditional Buddhist practices, but considered them to have any value only insofar as they might facilitate a lifestyle centered on recitation of the nembutsu. Other than that, in his view, they had no intrinsic merit. Another crucial aspect of Honen's work was that he put into practice the Mahayana belief that all sentient beings have the opportunity to achieve enlightenment, Buddhahood, and nirvana. For one thing, the intermediate step provided by the Pure Land doctrine clearly brought that point to the forefront. But what good is it if the common people, for whom the gates of the Pure Land stand open, are not taught about it and, thus, do not know about the efficacy of the nembutsu? At the time Buddhism was to a large extent the religion of those who were educated, and--by implication--those who were sufficiently well off to receive an education. Honen took his message directly to the common people. A sizable number of his followers were living on the fringe of society, including former criminals and prostitutes, who rejoiced at the message of the Pure Land. Honen's success irritated the leaders of the Tendai movement, who complained to the emperor that Honen's disciples spoke disparagingly about other forms of Buddhism. 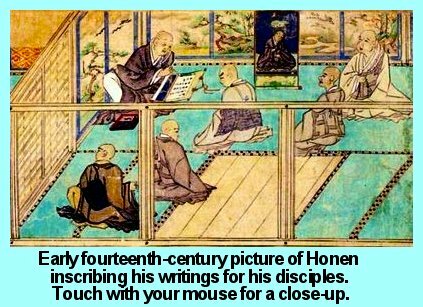 Honen was not about to cease teaching the nembutsu, and the emperor was satisfied when he and a large number of his followers signed a document pledging that they would not speak out against other Buddhist groups. However, circumstances did not go in Honen's favor. He had to endure the consequences generated by the enthusiasm of some of his followers, not to mention their unacceptable interpretations of his teaching. The writer Soho Machida (Renegade Monk, U. of California, 1999) describes Honen's approach as an "ethic of inversion" (p. 123), which is to say that the ritual and moral demands of Buddhism were only supplementary to the nembutsu. Some of his disciples extended this concept to mean that having recited the nembutsu, a monk is free to live according to his sensual impulses and commit acts of immorality with no consequence. Honen decried those men who twisted his teachings in such a manner. In search of ephemeral delights, they have ceased to fear the prospect of eternal life on the other side of the river of Sanzu [hell]. When they preach at all, they preach that believers in Amida's Vow need not eschew the five terrible sins, that they should wholeheartedly commit them; that believers should wear the clothes of laypeople instead of donning the kesa robe; that believers need not avoid fornication, nor the devouring of meat--that they should eat deer and fowl as much as they wish. (From Honen Shonin Zenshu, ed. Ishii Kyodo (Kyoto: Heirakuji Shoten, 1955), p. 804). One may be reminded of how the apostle Paul was accused of teaching that one should let sin abound so that grace would abound, or of the misunderstanding of Martin Luther's famous saying: "Sin boldly and come to the cross boldly." Neither one of them advocated committing sins. For example, for Luther, the expression "Sin boldly" meant to own up to one's sinful state and acts forthrightly and without excuses because only people who admit sin in their lives can go to Christ and receive forgiveness. Similarly, Honen taught that Buddhist practices were good and important; they simply did not affect someone's ultimate destiny. Nevertheless, in giving traditional practices such an ambivalent standing, Honen himself must have created some confusion among those who were not capable of making significant logical distinctions. His teaching also included an iconoclasm that must have shocked many of his listeners. At one point, he received a letter from some women of high social standing, asking one hundred and forty-five questions, each of which he answered in document called the Ippayaku-shiju-gokajo-mondo. Here are some excerpts, as quoted by Machina (p. 123). You will note that the concerns that the ladies brought up had more to do with folk religion and superstitions than with Buddhism. But for many lay people right up to today the distinction is often blurred. They say a baby is impure for the first hundred days and should not be brought to a shrine for worship. Is that so? Newborn babies are not impure. If you think of them as impure, then they are. But that applies to many things other than babies. If one has eaten scallions, onions, spring onions, or meat, is it okay to chant before the smell has disappeared? Nothing obstructs nembutsu. My seven-year-old has died. But you have said that purification is not necessary? Buddhism does not know of purification. All that is secular. Is it true that it's sinful to die before one's parents do? In our impure land, we cannot do much about that anyway. Should one ask a priest for the reading of sutras? If you can read, then go ahead yourself. Furthermore, as we already said, was unsympathetic to Honen's apparent innovations and used every means at their disposal to influence the government to suppress the Nembutsu school, though the emperor was relatively tolerant for quite a while. However, he drew the line in 1207 when two female courtesans attended a Pure Land service and converted to this faith behind his back. The two monks who were directly involved in this event were executed, Honen and all of his followers were held responsible, and so the seventy-five year old master and his other disciples were sent into exile in different inhospitable areas of Japan. However, Honen could not suppress his commitment to his calling. He actually voiced gratitude for what was supposed to have been his punishment. My exile is the expression of Imperial courtesy, because otherwise I could not bring the teaching of the nembutsu to the people who have never had the opportunity to meet me and listen to me directly. 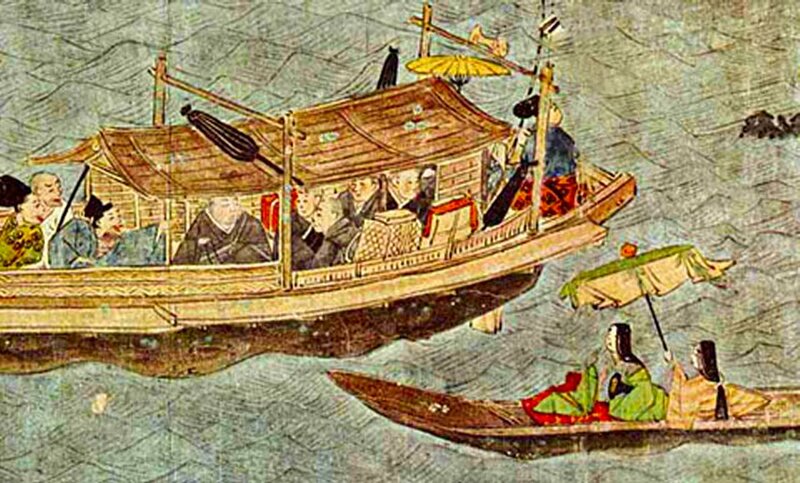 True to his word, along the way to the outlying island where he would be confined, he continued to preach the nembutsu. The actual duration of his exile was less than a year. He started his trip outward in the middle of March AD 1207, and was officially declared free again in early December of the same year. The one stipulation was that he was barred from the capital city of Kyoto. He moved to Osaka, where he spent the next few years until he received permission to enter Kyoto towards the end of AD 1211. A few weeks later in January of AD 1212 he died. His legacy is well-captured by the short single-page statement of his beliefs (Ichimai-Kishomon, which he wrote at that time. As Jodo Shinshu website describes it, the brief summary leads directly to an exhortation. "In the document Honen stated the essence of his faith, telling followers that the nembutsu is the ultimate way of universal salvation, so make every effort to practice it without bothering with your own finite knowledge."